Take your OT practice to next level! Learn to look through Holistic OT L.E.N.S with confidence and skills! You will get the tools you need to effectively assess/address Lifestyle, Environmental, Nutrition and Stress Factors that impact on our client's health. you will learn practical skills, applicable information and protocol's to implement with your clients helping them reach therapeutic goals and improve their quality of life. 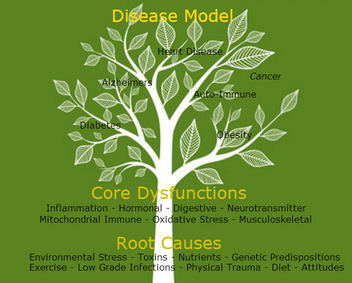 you will learn the health-building process which looks to find and heal the root cause of health complaints unlike the conventional medicine model which focuses on treating symptoms. Presented by Tina Gilberti, OTR/L, FDN-P, founder of Holistic Wellness with Tina Gilberti. Putting it all together using my Holistic OT L.E.N.S. Questionnaire (adult and pediatric versions). Gallbladder function...is it really a dispensable organ? What are the stress hormones involved in the stress response? What are the differences between the most common therapeutic diets (i.e. Gluten Free/Casein Free, Feingold, Paleo, Low Oxalate, etc.)? When are special diets indicated? What are the benefits of each diet? What does Methylation and sulfation have to do with it? What is insulin resistance and how it affects the brain? What's the liver's role in blood sugar regulation? Module 12: Connecting the Dots using a Holistic OT L.E.N.S. What is a Biofilm and how to address it? Holistic OT L.E.N.S (formerly NE4OT's) is a comprehensive, informative and holistic approach of nutrition and how it relates to Occupational Therapy. Tina gives you the tools necessary to explore body systems, lifestyle factors, root causes and solutions. Tina brings great energy and passion into every session. She has inspired me to continue my pursuits within the area of functional and integrative nutrition as I believe this is the healthcare of the future. I would like to thank Tina for a great course and ongoing support throughout the webinar. I found the course to be very informative and thorough, covering all the topics in great detail in a way that is easy to understand and remember. Nutrition and wellness are my passions and Tina made it possible for me to learn and apply this knowledge in my everyday practice. I recommend this course to anyone who is interested in expanding their knowledge on the topic of nutrition and the importance of nutrition in overall well being and health. Tina you are an inspiration! Thank You! Taking the Holistic OT L.E.N.S./Functional Nutrition Training has helped me grow as a Certified Occupational Therapy Assistant and a person in so many ways! Now, when seeing patients I feel like I can look at their entire situation and make recommendations that will help target the true underlying cause of their problems, and not just cover them up or resolve for the short term. I work in the pediatric field with an emphasis on Sensory Processing Integration. Knowing the information from this program has helped me empower parents by giving them the information need in order to talk to doctors, allergists or other practitioners so that they can get appropriate testing or procedures done to help their children. This training has also helped me to grow as a person by igniting a “drive” in me to increase my knowledge base in this area through further education so that I can help prevent disease that may be caused by the factors discussed in this training. Thank you Tina!